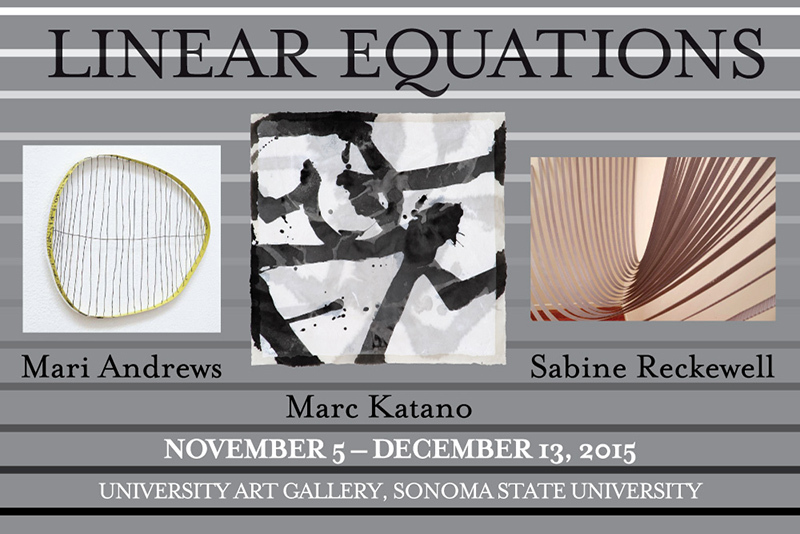 Sonoma State University Art Gallery's new exhibition, "Linear Equations," brings together three Bay Area artists whose work shares an affinity for line in both two and three dimensions. The exhibit opens Nov. 5 with a reception for the artists, Mari Andrews, Marc Katano and Sabine Reckewell, 5-7 p.m. and will remain on view through Dec. 13. Andrews lives in Emeryville and creates intricate sculptures that have evolved from years of drawing and obsessive collecting. Her work weaves the two activities together, incorporating wire, pine needles, branches and other linear material. Katano's largely black and white paintings, at once delicate and vigorously gestural, are inspired by the physicality of human expression, such as the precise motions of Japanese calligraphy. While his compositions are organic in form, Katano, a Sonoma resident, does not intend them as emulations of nature but rather abstract records of their own creation. Reckewell lives and works in Napa, creating site-specific installations that respond to the architectural space in which they are created. She calls these installations "three-dimensional drawings," and they indeed trace, describe, and make visible the volume of their environments using linear materials, repetition and geometry. Since 1978, the University Art Gallery at Sonoma State University has been a central part of Sonoma County's growing visual arts community. The gallery's mission is to serve as a source of educational and cultural enrichment for the campus and surrounding communities through exhibitions, programs and publications that promote the understanding and appreciation of modern and contemporary visual art from throughout the United States and beyond. The University Art Gallery is open Tuesday-Friday, 11 a.m.-4 p.m., Saturday and Sunday, noon-4 p.m. Admission is free, parking on campus is $5-$8. For more information, call 707.664.2295.